SquigglyTwigs Designs: Tuesday's Tute: Cheerfully Pink! Curly has grown! She needs warm clothing for fall and winter. The quickest way to fun clothing that fits, upcycles and fast leggings. A little hair bling always adds a fun touch, too. All three of these pieces are from previous tutorials. Take a new look. Sweater Upcycle: I did add a piece of lace to the bottom to give the appearance of a bit more length. 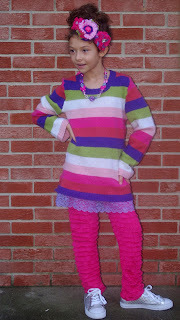 Ruffle Leggings: Ruffle fabric is easy to find online and in stores like Hobby Lobby and JoAnns. It runs about $10 per yard most anywhere. It sews like any knit fabric. Floral Headband: I used a few tutorials in this headband. The two rolled flowers and the headband are from this tutorial. The larger flower is a mix of silk and sweater made like this tutorial. This outfit cost $12 ($10 for the ruffle fabric, $1 for the sweater, and $1 on the extras) and took me less than an hour.